Opposition MPs in the LOP’s board room strategising for today’s plenary sitting. Courtesy photo. KAMPALA–The Speaker of Parliament, Rebecca Kadaga, has adjourned Parliamentary business to tomorrow following renewed chaos in the House. Chaos once again erupted in Parliament as Opposition MPs insisted on blocking the motion seeking to amend Article 102 (b) of the Constitution to allow President Museveni vie for the Presidency of the country beyond the constitutional limit of 75 years. The contentious age limit bill remained an elephant in the room as MPs discussed committee reports including reports from the Ministry of Energy as well as the report on the city abattoir, among others. However, pandemonium came when opposition legislators realized that Igara West MP was getting ready to present the contentious bill. The opposition legislators started singing the first stanza of the national anthem endlessly and holding the Ugandan constitution high with the major aim of disrupting parliamentary business. Attempts to bring them to order by Speaker Rebecca Kadaga were futile and she decided to adjourn the session to tomorrow. 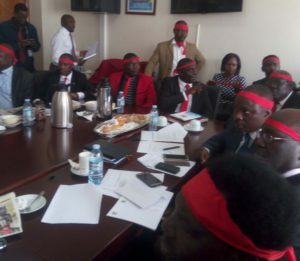 Robert Kyagulanyi, the MP for Kyaddondo East said the fight to defend the Constitution is not a battle of numbers but a battle between right and wrong. He said the opposition is determined to defeat the proponents of the age limit bill.